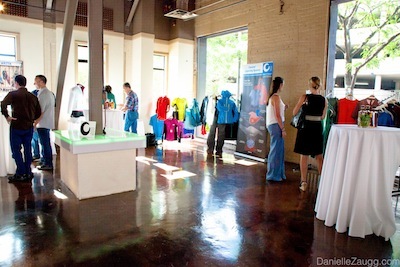 Outdoor Retailers Summer 2012…Come back, Come BACK! Let’s talk Outdoor Retailers Summer 2012!!! As you all know, we here at Pierpont Place L-O-V-E the Outdoor Retailers convention that comes to our fine state twice a year in winter and summer! 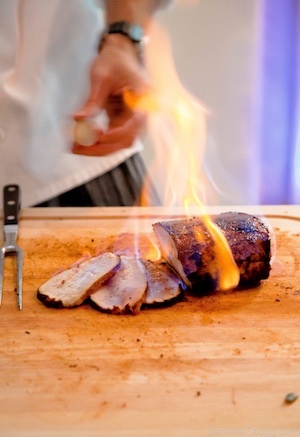 We’re not the only ones who love the big OR Show–Salt Lake City thrives when this crew comes to town with thousands of national and international travelers, their hearty appetites, awesome outdoors gear and their thirst for FUN! Every time that these fantastic adrenaline-junkies show up at the Salt Palace, Pierpont Place kicks into gear to enjoy a week of parties with some of the coolest businesses at the convention! We kicked off our Outdoor Retailers excitement with Verde PR’s 2012 Speak EZ; a boisterous flapper and gangster themed pre-show event for the OR–I mean, honestly, how could that NOT be fun! Verde PR is a Wyoming and Colorado based public relations and consulting firm that represents several outdoors-y brands (among many other clients). The Speak EZ was a fun and lively way for 14 of their outdoors, fitness, and natural product clients to meet, shmooze, and practice the quick business pitches that they’d be using for the next few days at the OR show, all while enjoying food, drinks galore, and great company! When I say “drinks galore,” I really, really mean it! 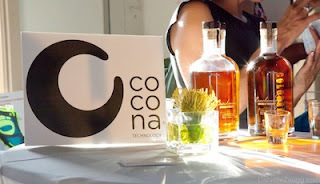 Verde PR didn’t use the term “speakeasy” lightly…this event was reminiscent of Prohibition era alcohol establishments (except that this liquor was absolutely legal, and outdoor retailer technology has come a long, long way since then)! 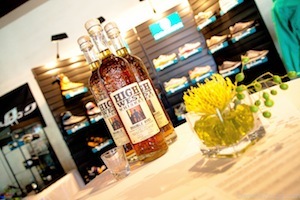 Scattered amongst each of the 14 retailers were tasting tables of 14 different brands of whiskey, vodka, and gin! My favorite new liquor finds were Pendleton Whiskey from Hood River in Oregon, and Anchor Distilling Junipero Gin from San Francisco, although I have to stay true to my dear Utah and say that High West’s Double Rye Whiskey always knocks the competition out of the water! 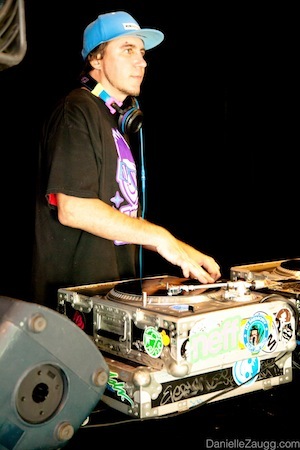 As SLC local DJ Knuckles was spinning tunes, attendees were strolling from one amazing retailer’s booth to the next, sipping some of the best brands of whiskey, vodka or gin and getting a head start on other OR pass holders in seeing some of the coolest new products in the field from Cocona, Ibex, Julbo, Metolius, Mountain Mama, Nikwax, Northside, Outdoor Research, Princeton Tec, SCARPA, Tern Bicycles/Biologic Cycling Products, Vapur, Zuke’s Pet Performance Nutrition, and K2 Outdoors Atlas and Tubbs Snowshoes! 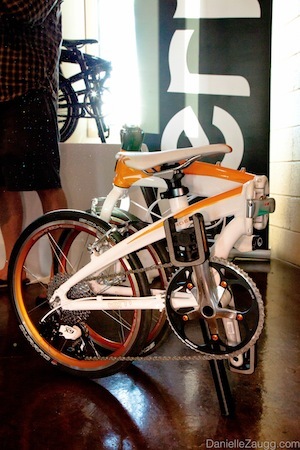 No exaggeration–these companies seriously do have some of the niftiest products ever! Cocona Inc from Boulder, Colorado will soon be the BIGGEST thing in the outdoor apparel industry–their patented technology enhances the performance of fabrics for breathability, waterproofing, UV protection, and (whew!) odor management! The Cocona booth had a display showing just how good their technology is for waterproofing and wicking away water from outdoor apparel fabrics, and I have to say, I was convinced! SCARPA outdoor shoe company gained my approval not only because their shoes are amaaazingly comfortable, but also because each pair that they had on display at the Speak EZ was named after a refreshing cocktail (my favorite, the Mojito!) 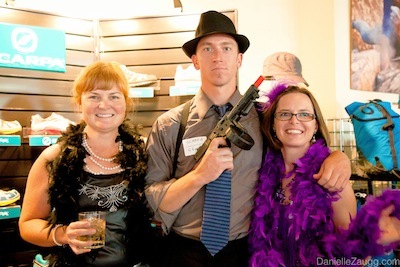 Gotta give kudos to the SCARPA representatives as well, for being some of the only attendees who truly embraced the flapper/gangster Prohibition theme (look at the first picture on this post to see what I mean)! I was just about ready to hand over a few hundred dollars and ride home on this one! All in all, a delightful party with some seriously awesome toys, tools, and travelers! 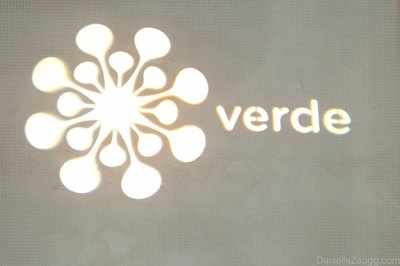 Thanks to Verde PR for bringing your Speak EZ to Pierpont Place…we had a BLAST! 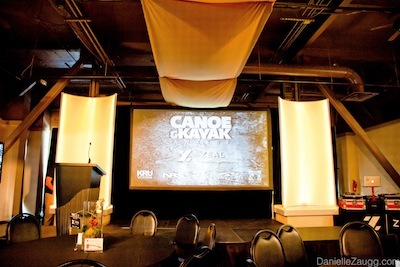 The next night, we kept the party going with the Canoe and Kayak First Annual Awards Banquet, presented by Zeal Optics! We’ve hosted Canoe and Kayak Magazine at Pierpont Place before, but this event blew the others out of the water! As the party started, we began to think that Canoe and Kayak should add another category…Partier of the Year, which everyone there would have won by the end of the night! 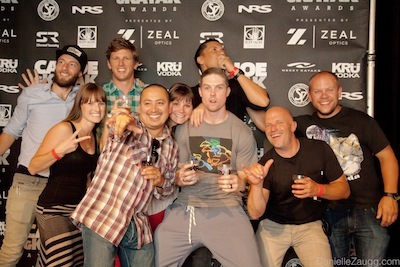 With all of the excitement of the awards ceremony and the beginning of the Outdoor Retailers Show, it’s not wonder that the gathering was boisterous and rowdy all night long! In true OR fashion, we kept the drinks flowing with Utah-based Shades of Pale Brewing Company’s bottles galore, and Kru Vodka, one of the event sponsors! 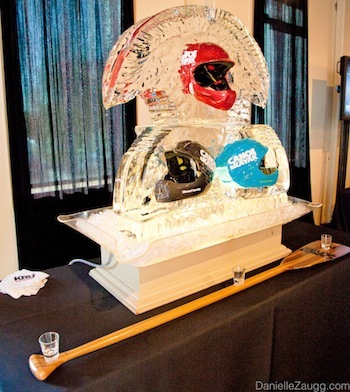 We encouraged the fun with a Canoe and Kayak ice luge (HUGE HIT) and a shot paddle (we thought it was fitting)! 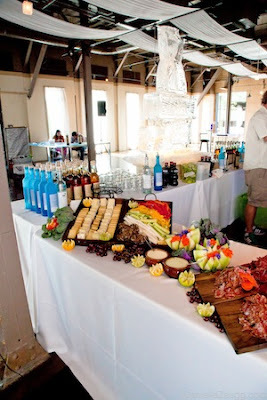 As platters of delicious hors d’oeuvres (like thai peanut chicken with chili sauce and chives, shaved prime rib with creamy horseradish sauce, and bruscetta with crumbled feta…yum!) made their way around the crowded room, the adrenaline-pumped guests danced, drank, and talked for hours about their latest adventures paddling down hundred foot waterfalls and through Class 6 whitewater rapids! 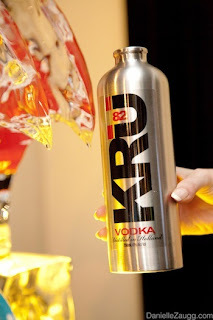 Photographers were kept busy taking pictures of attendees in front of the step and repeat as the DJ filled the room with party music and our bartenders kept everyone hydrated and happy! As if all of this excitement wasn’t enough, the actual awards part of the night had everyone clapping, cheering, and toasting as the videos of the winners were shown– check these two videos out to see the kind of adventurers we’re talking about here! What a priceless night with some truly awe-inspiring people! We LOVED partying with you, Canoe & Kayak! 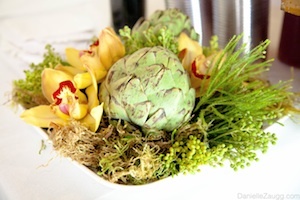 Hope to see you next year for the Second Annual Awards Banquet! To wrap up our Outdoor Retailers fun, we spent the next evening hosting one of our very favorite Salt Lake companies! Pierpont Place has been lucky enough to work with eXperticity (formerly known as SwarmBuilder) and its children companies, 3point5 and Promotive, for several years, and they just keep on coming back to us (thank you, thank you)! As always, eXperticity’s party was the classiest thing going on in the city that night, and the crowd that filled Pierpont Place enjoyed the very best that Utah has to offer in drinks, cheeses, meats, and chocolates (and, of course, the very best Utah event venue)! 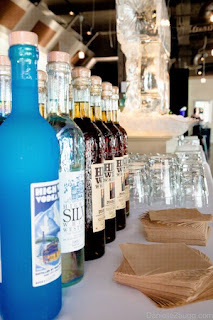 Park City based High West Distillery (one of our favorite vendors) supplied the party with their famous and absolutely delicious whiskey and vodka (these guys can make a Whiskey Sour like non-other)! 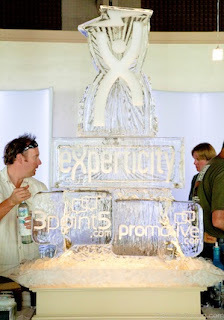 eXperticity’s usual exquisite ice sculpture sat in the middle of the bar to keep shots and drinks perfectly chilled! For those who wanted something to snack on with their drinks, we had some local cheeses from Beehive Cheese Company (my constant go-to is their espresso cheese) and Gold Creek Farms (incredible smoked cheddar). The cheeses were accompanied by a whiskey cured salami and a scrumptious moccetta (italian cured ham) from Creminelli Fine Meats, another SLC local company. 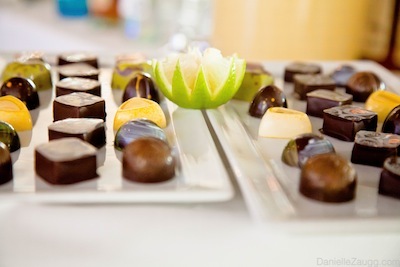 To satisfy even the most aching sweet tooth (like mine), there was a spread of beautifully decorated (and extremely tasty) chocolates were supplied from Chocolate Sweet Confections in Ogden and from Millcreek Coffee Roasters. If you’ve read our previous blog posts about our parties with eXperticity, you’ll see that many of these treats have remained constant–that’s because they’re the best of the best and we LOVE to support our lovely Utah! 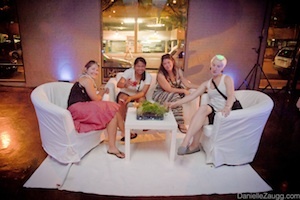 Guests for the eXperticity party enjoyed an elegant blue and white décor with some gorgeous and unique floral arrangements by our in-house florist and decorator. The party went on all night as guests sat in our comfortable lounges and enjoyed the fantastic drinks and delicious food, which went beyond the aforementioned snacks to include mouthwatering entrées cooked to order! As always, eXperticity’s party offered amazing company and good conversation! 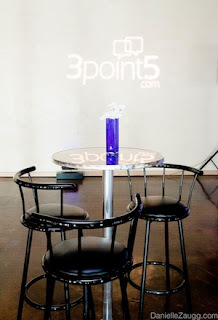 For those who don’t know the company, check out our post about their party at Pierpont Place place last January, where the company’s mission and their recent changes are detailed from a conversation with Patrick Purcell, eXperticity’s Senior Marketing Manager! What a fantastic company with dedicated, knowledgeable and excited leaders, passionate about what they do! Always such a good time hanging out and hosting parties with eXperticity, 3point5 and Promotive–can’t wait to do it again this winter! 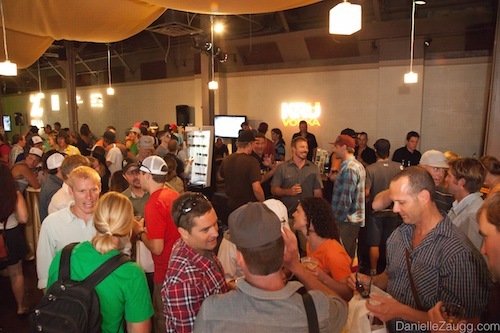 It should be obvious why the two times annually that the Outdoor Retailers Convention comes to Salt Lake City are our favorite weeks of the year…these folks keep us busy and they know how to live it up! Keep on coming back, Outdoor Retailers–We LOVE you! 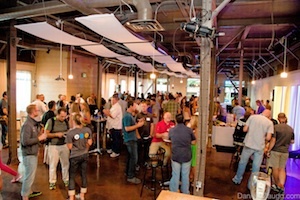 Verde PR, Canoe & Kayak Magazine, and eXperticity–Thanks for the stellar parties! We hope to see you again in a few short months, when the weather turns chilly and (hopefully) the snow starts to fall! Until then, we’ll keep in touch through Facebook and Twitter, and we’re always reachable through our website! Thanks for providing this Outdoor Retailers Summer, but I want to know corporate event locations in chicago. 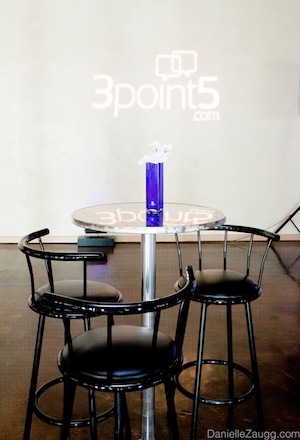 If you have any information regarding corporate event locations in chicago, then please share your reviews with us.